A special Scioto Valley Traction excursion train in third rail territory. The double track indicates this is located between Columbus and Obetz Junction. The photo caption says this was taken south of Chase in 1906. This photo has been published many times. Still it provides the viewer with the best example of service on the SVT with big interurbans in one, two or three car trains traveling through Ohio farm land on the way to Lancaster or Chillicothe. Luke C. Bradley, superintendent and William Bobst, motorman are at the front end. N.E. Rees is on front steps of rear car. Photo from the AJC Collection. The Scioto Valley Traction interurban took a twisting, turning route out of Columbus. The line ran from the SVT depot at Third and Rich Streets in Columbus east on Rich to Fifth Street, South on Fifth, jogged onto Mohawk Street, South on Mohawk to Reinhard Avenue, east one block to Jaeger Street, south on Jaeger to Hanford Street, west one block on Hanford to S. Fourth Street, south on S. Fourth to Barthman Street, East on Barthman two blocks to Parsons Avenue, South on Parsons crossing the T&OC Railroad along side Buckeye Steel Castings and on to private right-of-way. The SVT continued south to Obetz Junction where it split with one branch going to Lancaster and the other to Circleville and Chillicothe. The return trip through south Columbus traveled the same path except it took Innis Street instead of Barthman. 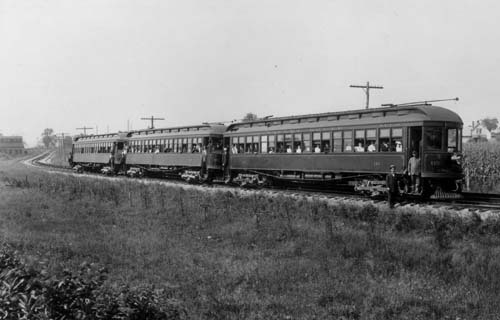 The SVT was Ohio's only third rail electric interurban. In the rural county side the cars received their 600 volt DC power from the third rail which sat adjacent to the running track. When on city streets the conductor would put the trolley pole on an overhead wire to receive power. Those conductors were skilled at putting up that trolley pole while the car was still moving. An acquired skill as both the trolley wire and trolley pole would be in constant motion. The SVT used big interurban cars that were more like a steam railroad sized car than most small country interurbans. 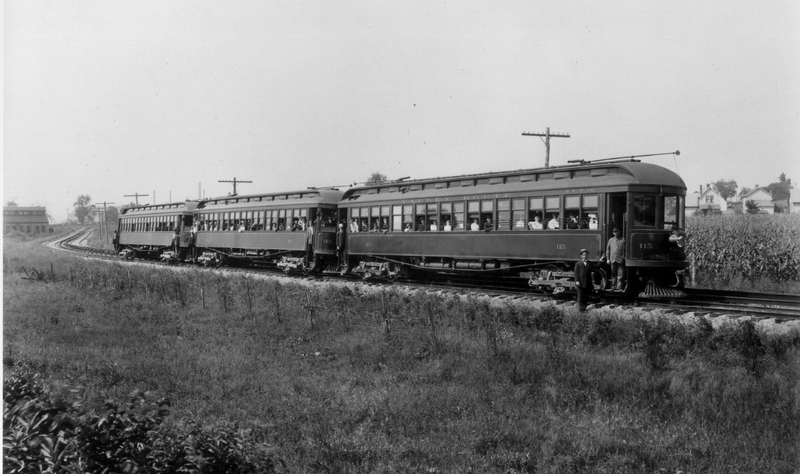 They could operate in three car trains which must have been a sight going through south Columbus especially around Schiller Park and on Mohawk Street through Columbus' German Village. The SVT was completed in 1904 and ended passenger service in 1930. A freight only line using box motors and later steeple cab electric motors delivered coal from the C&O RR in Groveport and the N&W RR in Obetz to the Columbus & Southern Ohio Electric Co.'s Picway Power Plant, about 10 miles. At that time the company was known as the Ohio-Midland Light & Power Co. The freight line was dieselized in the early 1950s and is now out of service.